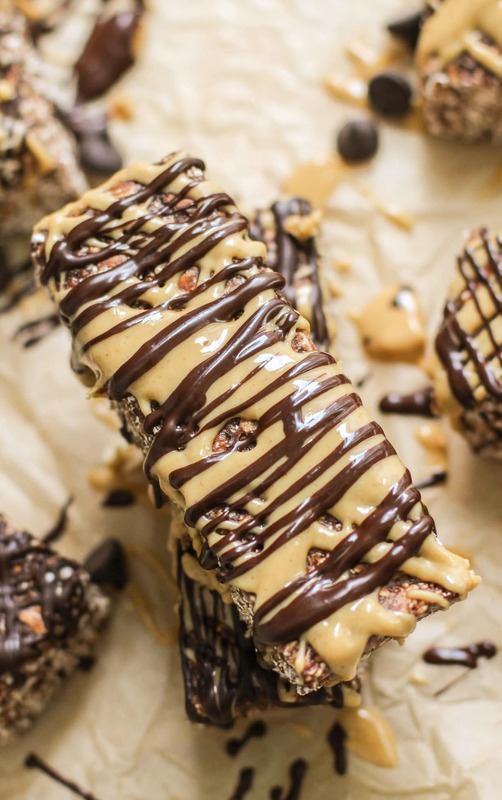 Healthy No-Bake Chocolate Peanut Butter Granola Bars — chewy and hearty, sweet, chocolate-peanut butter deliciousness. Secretly refined sugar free, high protein, high fiber, and gluten free too! These Chocolate Peanut Butter Granola Bars are soft and chewy, not hard and crunchy like the typical storebought ones. I’ll take the whole pan if you don’t mind. These are perfect bars of… perfectness. Hah. I’m sorry if my words aren’t making any sense. I’m enjoying a bar of “perfectness” as we speak. I love how these are filled with chocolate-peanut butter flavor, and I appreciate that they’re mildly sweet. While I’m totally okay with tooth-achingly sweet goodies in the morning, most people prefer something a little more tame as their first meal. It would be an understatement to say this GIANT granola bar was “calling my name.” It was basically yelling at me to chomp its head off. 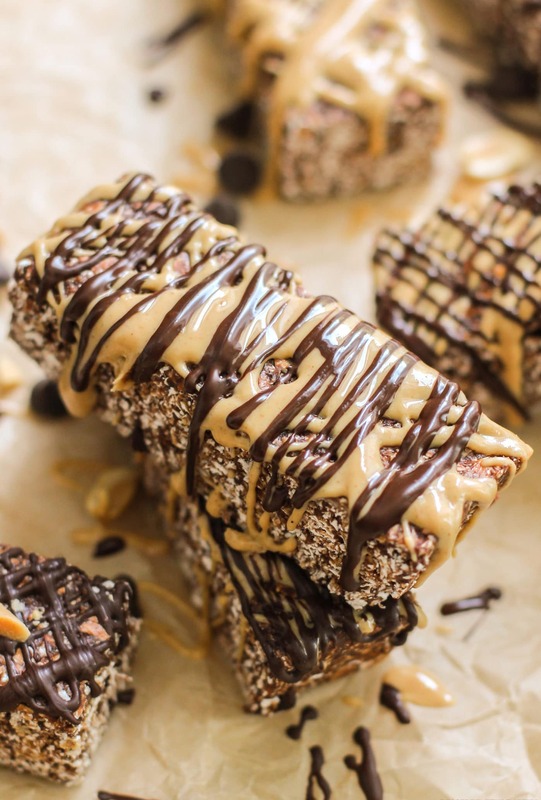 These no-bake Chocolate Peanut Butter Granola Bars are chewy and hearty, sweet, chocolate-peanut butter deliciousness. Secretly refined sugar free, high protein, high fiber, and gluten free too! Line a 9" brownie pan with parchment paper both ways. In a stand mixer with with beater attachment, add the applesauce, peanut butter and stevia extract. Mix on low speed. Turn off the stand mixer and add the protein powder, cocoa powder and salt. Mix on low speed until fully combined. Dump in the oats and mix until fully combined. Scoop the mixture into the prepared pan and spread it out. Place a sheet of parchment paper on top and press the mixture down further until compact. Cover the pan and refrigerate overnight. The next day, slice and serve! To store, place the granola bars on a plate lined with a sheet of parchment paper and keep in the refrigerator. Keeps for ~1 week. Feel free to add a handful of roasted peanuts and/or mini dark chocolate chips to the recipe! 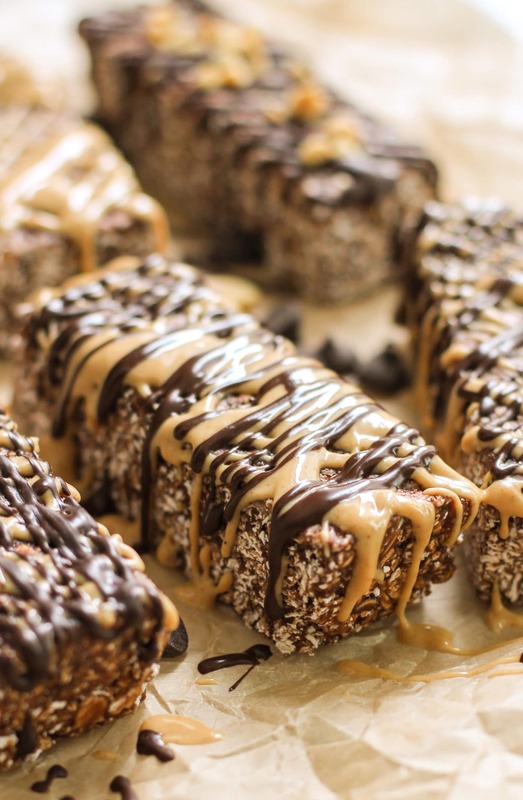 Recipe adapted from these No-Bake Nutella Granola Bars. 330 calories that sure tastes like 3,300! Not to mention, a whopping 19g of protein, 7g of fiber, and NO added sugar. 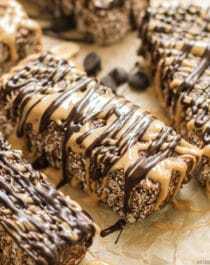 These granola bars are quite large (especially if you top ’em with warmed peanut butter and melted dark chocolate, like I did), so if you want smaller portions, feel free to slice the pan into 15 pieces (5×3), or whatever size you like. Bigger is always better when it comes to healthy desserts (and breakfasts), in my book! I put each granola bar in a sandwich baggie in the fridge so it would be easy to grab when ravenous and on-the-go. Enjoy! I recently came across your site through cutest food.com (your strawberry cake pops). I’m new to this kind of baking; mine is usually more of the flour, sugar, and butter kind, but you make healthy baking look so good. A question for you regarding protein powder – we can get unflavored protein powder for a lot cheaper than the chocolate or vanilla stuff…what would you suggest to make up for using the plain stuff? I would suggest adding more sweetener and more cocoa. I understand that many people do not own stevia extract, but this would be the easiest ingredient to add in order to sweeten up the bars without adding more dry sweetener (which is bulky and may change the texture if more is added), or calories for that matter! Below is a link of where I buy my stevia from (I would probably add 1/2 teaspoon of the recipe), but if you would rather use more dry sweetener I would add about 1/4 cup more (I would give the “batter” a taste before freezing, just in case you need more). I would also add about 2-3 more tablespoons of cocoa powder. Hope this works out for you! ^^ note that the cost is for two 4oz bottles (very large amount, since stevia is used by the drop–>teaspoon). I buy in bulk because I go through it faster due to my seemingly constant baking lol, and personal use now that I am trying to lower my sugar intake. You can find one 2oz bottle more much cheaper if you like. Thanks, Jess…one more question: I notice that at the end of a lot of your recipes you mention that next time you’ll try something slightly different. Do you ever go back and update those recipes to say how that went? If you have a specific recipe in mind you can let me know! I haven’t tried it so I can’t be sure. Greek yogurt is thicker and has a lower water content, so you will probably need to use more. That, or you can reduce the amount of oats slightly. You might also want to increase the sweetener since the applesauce provides some sweetness. Hope you like the granola bars! Regarding the nutritional breakdown: How many servings are the bars cut into for that info? I see 15 pieces noted but I’m not clear if that is for the note that they can be cut smaller.